Summer is the time to grab the tent and coolers or gas up the RV and head for the great outdoors for a campfire and time away from the city lights. 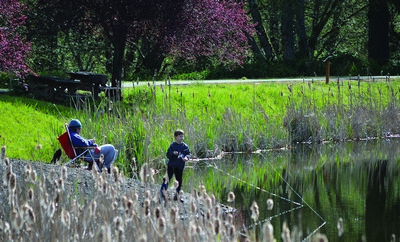 The Vernonia area offers multiple and varied camping experiences for you and your family. Anderson Park–Located just blocks away from downtown Vernonia, this park is the trailhead for the Banks-Vernonia State Trail. The tree shaded park contains 19 full hookup RV sites plus tent sites and group camping along the Nehalem River. A covered picnic shelter, flush toilets, showers, RV dump station and playground structure make this a perfect family getaway or great place to hold a group event. Open year round; call 503-429-2531 for reservations. Airport Park– Airport Park is a primitive campground tucked under scenic old growth trees alongside the Nehalem River just 4 miles southwest of Vernonia off Timber Road. It contains 23 primitive sites, a group tent site area, drinking water, children’s play area, and handicapped accessible pit toilets. This is a great place to head for a quiet and relaxing weekend. Sites are first come, first served. Vernonia Lake–This was once the Mill Pond for the Oregon-American Lumber Mill. Now home to bass, crappie, perch and bluegill, and is stocked each year by ODFW with rainbow trout. A paved trail encircles the Lake and connects to the Banks-Vernonia State Trail. A walk-in primitive camping area with fire pits, picnic tables, drinking water and a pit toilet is nestled on the backside of the Lake in between the dike and the Nehalem River; ADA compliant flush toilets are just a short walk back at the parking area. This little used gem is a great place to take the kids for a campout or for bikers and hikers looking for some solitude. 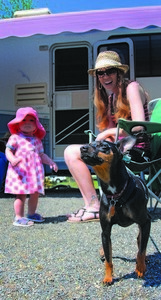 Mother and daughter rest outside their RV Camper parked at Stub Stewart’s Camper Park. Big Eddy Park– Part of the Columbia County Park system, Big Eddy is located 8 miles north of Vernonia on Highway 47. Named for the big eddy in the Nehalem River the park borders, it has 35 RV and tent sites. With a children’s play area, fishing, boat launch for canoes, flush toilets and showers, this is another great campground for the whole family. Scaponia Park–Another Columbia County park, Scaponia Park is a small, primitive, wayside campground located 10 miles east of Vernonia on the Scappoose-Vernonia Highway. Situated on a 7-acre nature park with a creek, this is a favorite spot for families in the summer and hunters in the fall. Be sure to explore some of the hiking trails that explore the adjacent BLM property. Once part of the O&C Railroad land grants, the rugged land is home to some majestic stands of timber.